The verb in French for drag, carry off, seduce, involve, entail, coach is the Regular er verb entraîner. To remember this imagine: dragging some cows ON to a TRAIN. 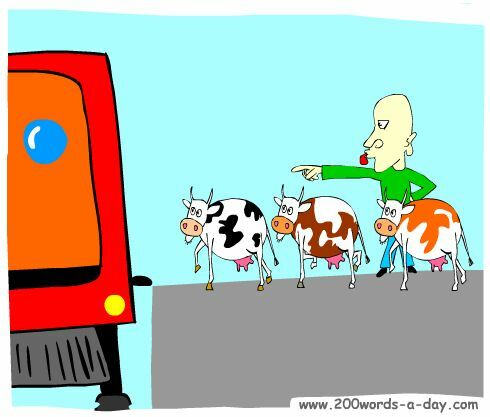 Imagine dragging some cows ON to a TRAIN!. entraîner: to drag, carry off, seduce, involve, entail, coach. s'entraîner (vr): to train, to prepare oneself, to encourage each other. une chanson entraînante: a swinging song. The French verb for drag entraîner is a Regular ER verb conjugated using the same pattern of endings as 5,000+ other Regular ER verbs. Learn to conjugate entraîner and it will reinforce the pattern for ALL Regular ER verbs, these being the most common French verbs. ✔ You can more easily remember words and verbs like the French for drag entraîner using the techniques of the world's Memory Masters. 200 Words a Day! Free Daily French Lesson Online - the verb in French for drag entraîner - fully conjugated. French Learning Made Fun and Fast with your free newsletter Verb Lesson - entraîner - the French for drag.